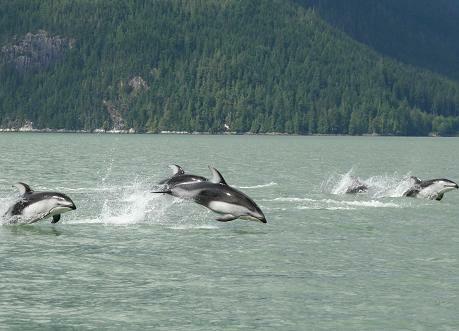 Pacific white-sided dolphins have a “good” habit of enjoying playing with a boat. Slowing a boat to 7 or 8 mph seems to provide a reason for this change in behaviour. The dolphins will pace the boat, nose into the prop wash of the motor and even ride the bow wave. They will often play for fifteen or twenty minutes then abruptly stop and go their way, This is the signal they have had enough and it is time to hunt for food. Any bear with three cubs has a full time job to find enough to eat to produce the milk to keep a family fed. 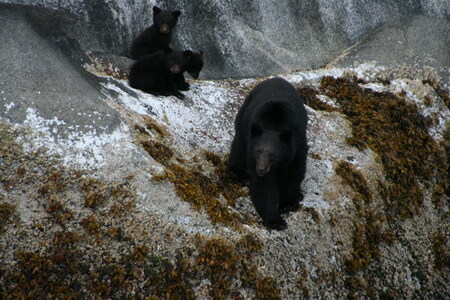 This photo was taken by Glen one of the camp guides on a morning tour to view grizzly bears. The rock ledge on the way up Knight Inlet is cover with barnacles and seaweed. The barnacles are food for the bear and by looking as the white area (that is where the barnacles have been scrapped away and eaten) it is easy to see that this bear has been busy. The cubs being to young to scrap the barnacles wait for mum to provide the milk. The splash in the lower right corner of this photo has the grizzlies full attention. The splash is from a school of salmon moving up river and this means it is lunchtime. 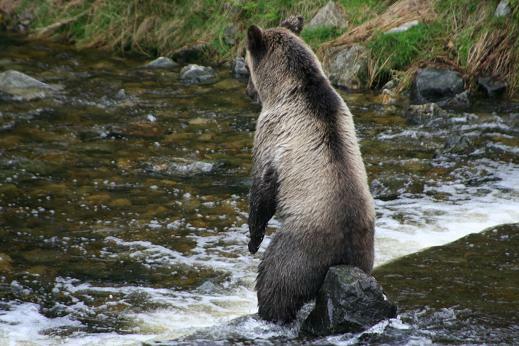 The grizzly is waiting in a deep pool for the salmon to cross over a shallow bar. 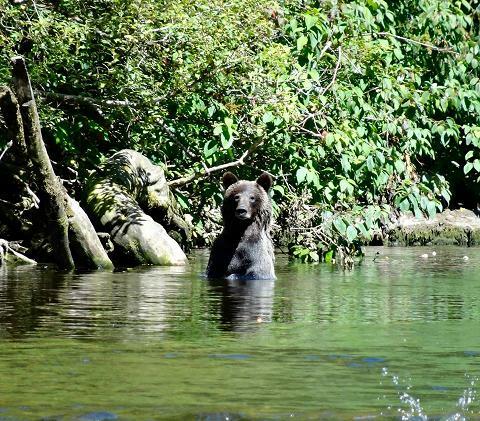 In most cases the grizzly would be in the shallow water as it is easier to catch the salmon but not all bears are created equal and this bear soon learned that deep water is not the best place to wait. 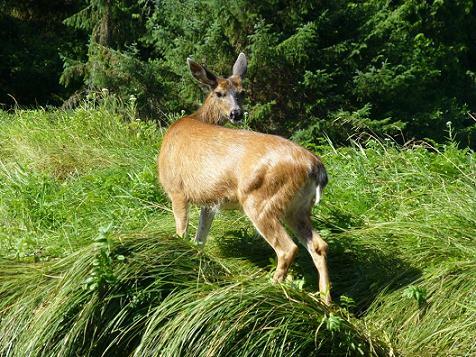 The black tail deer are a common sight in the river estuary where we view grizzly bears. They come to the shore to graze on the sedge grass and it is not unusual to see the deer and grizzlies grazing in the same area. The open and flat nature of the river mouth give the deer an advantage so the bears do not attempt to start a chase they cannot win. 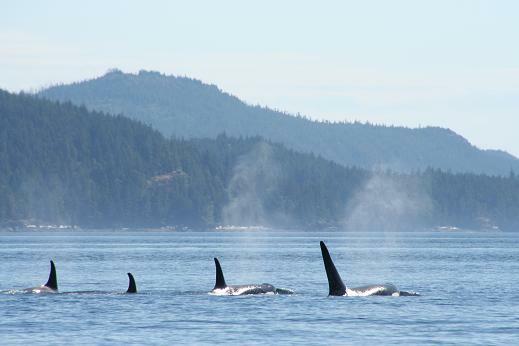 A killer whale pod often forms a tight group or reatline while traveling, and their breathing and movements will synchronize. Taking several breaths at the surface they submerge for a period of time before surfacing again. The time spent submerged increases as the “sleep” becomes deeper, and they may take up to ten breaths near the surface before submerging for as long as ten minutes. The grizzly bears tours from our lodge have one important date and that is August 24th. After to the 24th we are permitted to travel up the Glendale River valley and use the viewing platforms, which overlook the manmade spawning channel (October 24th posting an example). 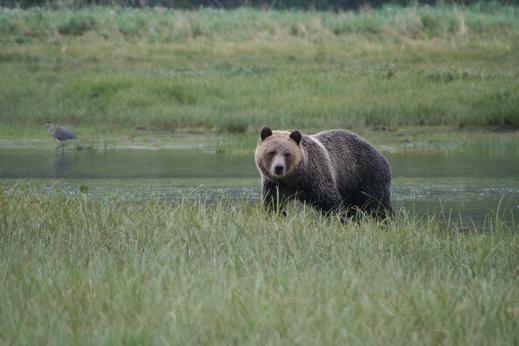 Prior to the 24th we use a 5.5 meter (yard) skiff to view grizzlies in the river estuary and along the banks of the river (October 23rd posting an example). Today’s post could be from either viewing time because going up to the viewing platform does not mean that we abandoned a tour up the river, if time permits. 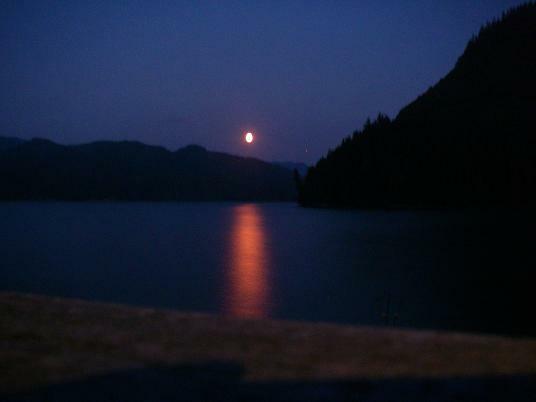 On a rare night when the sky is clear we have the moon from the front deck of Grizzly Bear Lodge. The length and size of Knight Inlet has an effect on the marine weather in the area of the lodge. Most evenings a high marine overcast rolls up Knight Inlet to block out the moonrise. Fortunately this marine cloud covering burns off by ten in the morning to produce a clear day. The viewing stands Grizzly Bear Lodge uses in the fall are located on Knight Inlet’s Glendale River. The stands are large enough to accommodate twelve guests but we only take a maximum of five per tour. The approach ramp to the to the viewing platform is a gated steel cage for a reason. 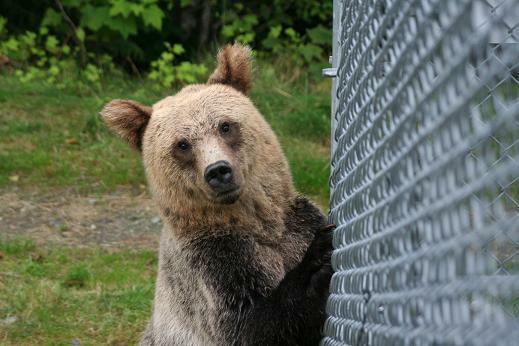 The reason is the subadult bear (that equates to teenage human male) who are curious and like to investigate their surroundings. If this were a zoo we would be the ones in a cage. 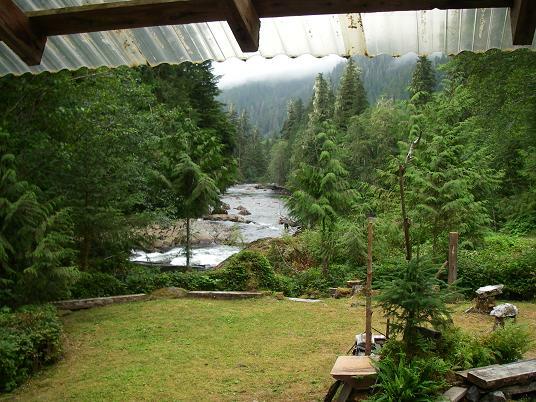 From the scenic walk along the edge of the river to the view from the deck of Trapper Rick’s cabin the extra day at the lodge with the Trapper is hard to explain. The best explanation was one I got this summer from a guest. 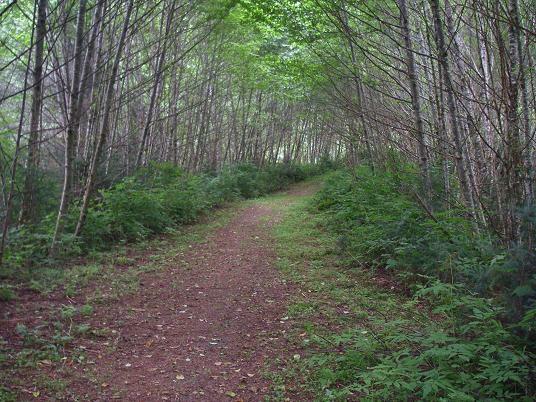 He said it is what city people idealized it would be like to live in the woods and enjoy nature without the interruption of job and neighbours. Maybe a little of Thoreau’s walden pond was part of the explanation. The viewing stands we use after August 24 offer some interesting photo opportunities. In the case it is a grizzly taking advantage of a strategically placed rock to rest while it waits for salmon to move up river into the spawning channel. The height provides a better view of the approaching salmon and a good position to launch an attack. Harbour seals are found in British Columbia often in coastal waters, estuaries and river systems. 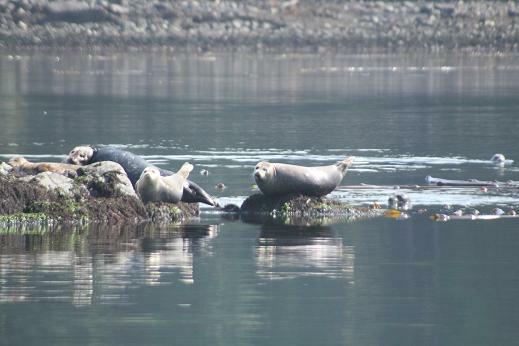 The Pacific harbour seal inhabits the B.C. coast. The adult seal may reach a length of 1.6 – 1.9 m (5 –6 feet) and weigh from 60 – 120 kg (132- 265 lbs. ), while ranging in colour from brownish to black with a speckled pattern. Your guide often takes them for granted because they are so abundant so remind them if you want a good picture.